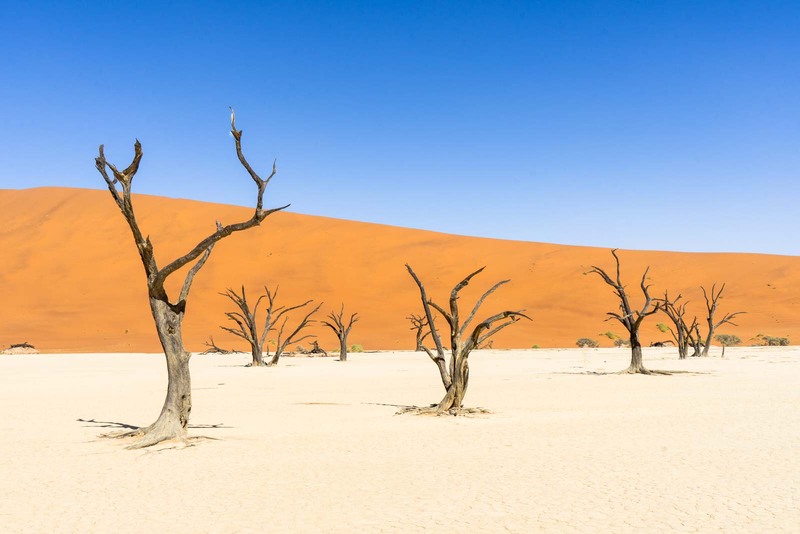 You can see why Deadvlei has been used as a filming location for a few movies over the years. Not by anything too famous, mind you. Unless you consider the 2000 movie ‘The Cell’ with Jennifer Lopez to be a blockbuster (I don’t). 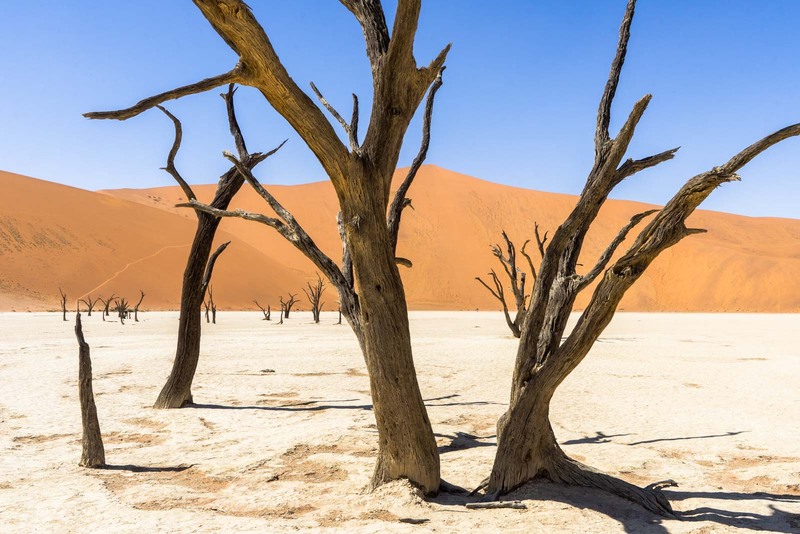 But the landscape you find here at Deadvlei in Namibia is fitting for the warped dream sequence that it’s used for in The Cell. There is something a bit eerie and unsettling about how everything looks here. As though it’s from another world, or another time. It could very well be something that you have imagined, because it doesn’t quite seem real. I arrive at Deadvlei after having already spent a couple of hours in the sand sea at Sossusvlei with my G Adventures tour through Namibia. Climbing Dune 45 and walking across the orange valley with the wind around me has left bits of sand all throughout my body. But as I approach Deadvlei, the wind disappears and the noise that has come from the gusts turns quiet. Silence. 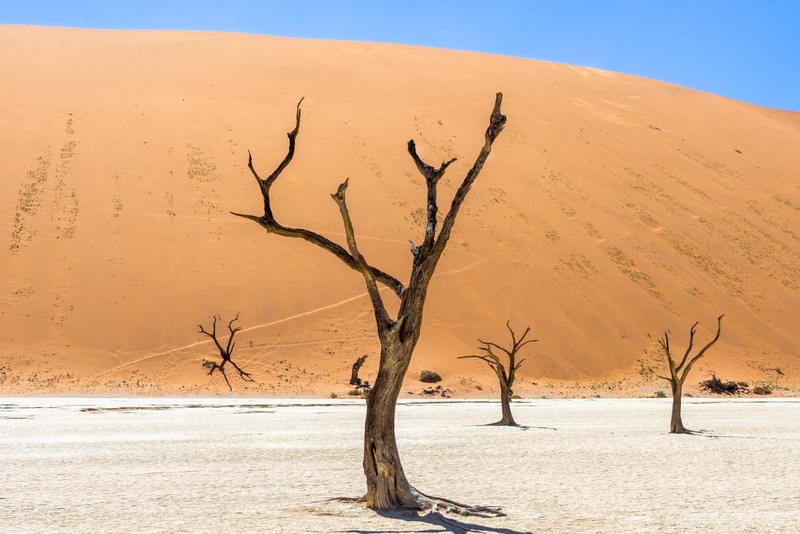 The walk from the carpark takes about 15 minutes and then, over the crest of a hill, I get my first glimpse of Deadvlei: The large bleached white clay pan with the 700-year-old dead black trees sticking out, reaching past the orange dunes to the blue sky. I go down the slope and onto white surface, turning out as I head deeper, the black figures all around me. It’s a spooky feeling, being amongst trees that are long dead, but still have so much presence. Did they die a gruesome death? They seem to be twisted in agony. Or even stretching out for help. It’s almost as if they were trying to save themselves when they were struck by a sudden natural disaster and frozen in this moment. Like Lot’s wife, or bodies at Pompeii. That’s not what really happened, though. The clay pan would have been originally formed during a rainy period in the desert’s climate. The nearby Tsauchab River would’ve flooded and created pools of water that allowed plants to grow. That’s when these camel thorn trees would have sprung up. Over time, though, the conditions would’ve changed and the water would have gradually dried up, leaving just the clay pan on the ground, rather than the orange sand. And without any water, the trees would’ve died. It’s estimated this happened about 700 years ago. 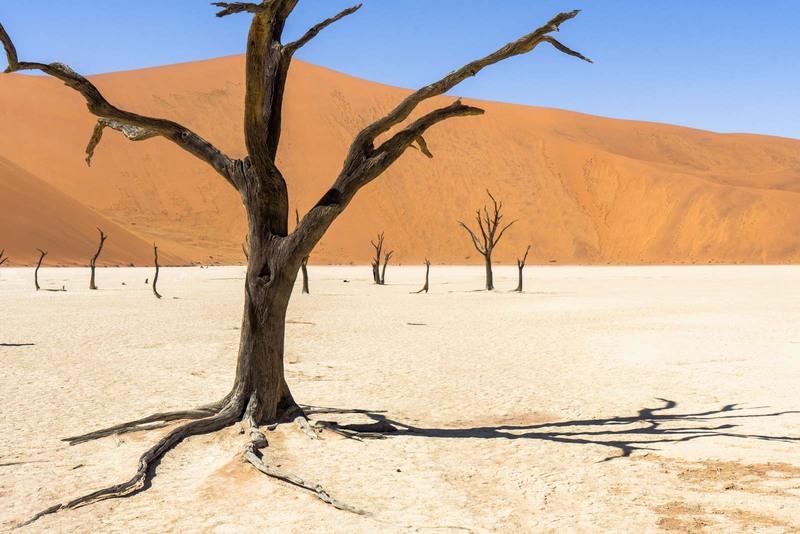 But, unlike in most places, two factors led to the strange sight we have here at Deadvlei. Firstly, the air was so dry that the trees did not naturally decompose. And, secondly, the clay ground became so hard that the wood of the trees was held solidly in place. These dead trees in the desert are not petrified… they are just scary-looking. It takes me a long time to explore them, walking through different parts, turning my head to see different angles, an infinite amount of perspectives. The bright desert light casts strong shadows of the trees on the white clay ground and they slowly rotate as the sun moves across the sky. It’s the closest thing there is to life for the trees. I can feel it. 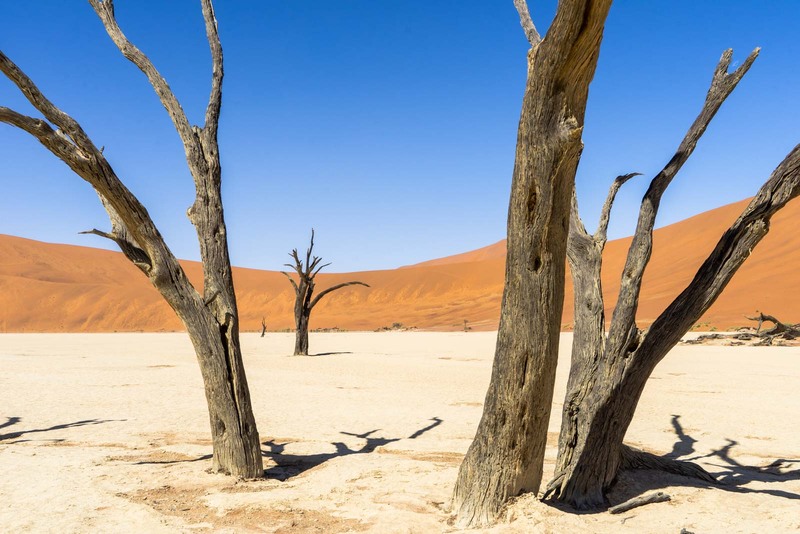 If you’re thinking of visiting Deadvlei (or Dead Vlei, as it’s also known) yourself, I have some tips to help you. I came to Deadvlei with my G Adventures tour and I obviously would recommend that. It’s a fantastic way to see the highlights of Namibia that takes out all the hassle of organising the tricky logistics for yourself. 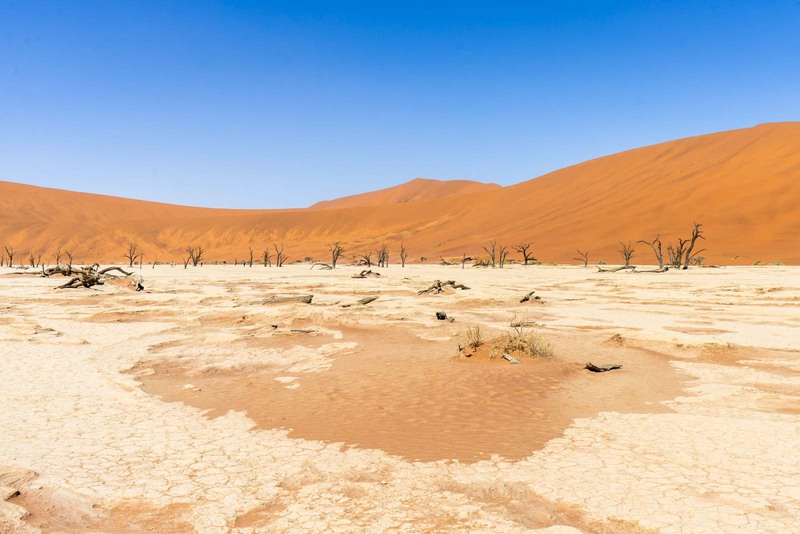 But if you’re travelling independently, you’ll probably want to visit Sossusvlei for at least a full day, to be able to explore all the highlights within the national park here. I have some practical information in my Sossusvlei story. 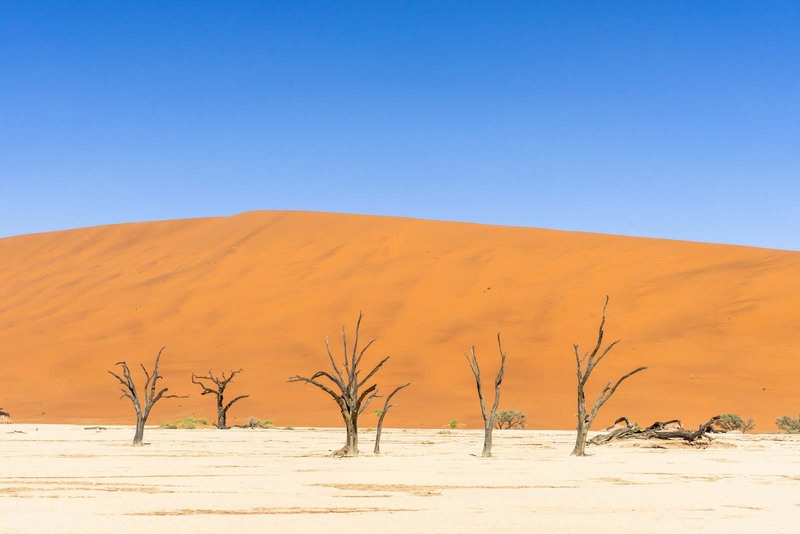 You can see much of Sossusvlei in a 2×4 vehicle but to get to Deadvlei you’ll need to either have a 4×4 vehicle or get a transfer with the park rangers from the 2×4 car park. From the Deadvlei carpark, it’s about a 15 minute walk to the clay pan itself. It is not actually that far but walking on sand slows you down a bit. Make sure you take water and sun protection…. You don’t want to end up like the trees here! Nice pictures, Thank you for sharing with us.